Car magnets make an impact everywhere you go. Sizes as large as 18"x24"
Custom car magnets can be used to quickly add a brand or promotional offer to your car or truck without damaging the paint. They are extremely easy to use since they work as any magnet, sticking right to the side of your vehicle. They are also perfect for small business owners that use their personal vehicles for work. If you don't want a permanent sign on your car, magnetic car signs can be added and removed on the side of your vehicle as needed. The 30 pt. magnetic stock will ensure your signs hold onto your vehicle under most conditions. For more information, give us a call. We are happy to help. It is easy to convert your vehicle into your brand ambassador without the need for permanent alterations or any specials tools. Simply print car magnets customized to your business or message. Because they can be removed quickly, they are a convenient choice for small business owners in any industry, and are especially handy for small food businesses that may not have the option of keeping one vehicle primarily for deliveries. Car magnets are also an excellent choice for driving schools, vehicle rental, as well as other small businesses. 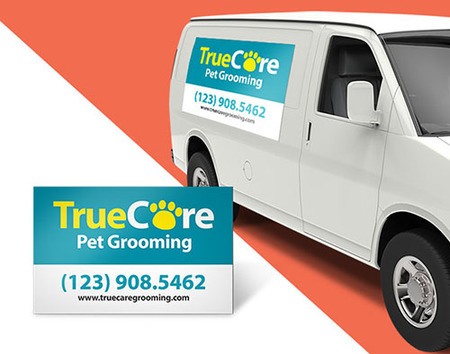 You can also advertise temporary offers and promotions on vehicles that already have your business logo. Car magnets aren't just for cars (or trucks, vans, and buses) either. They are also a handy choice when you to leave your mark in a big way on filing cabinets, cubicle, refrigerators, metal doors or any metallic surfaces.